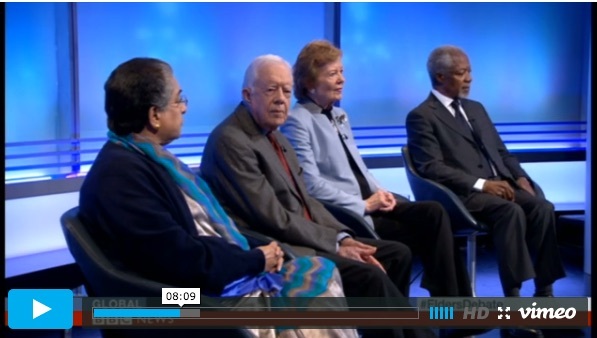 Four of the Elders, Hina Jilani, Jimmy Carter, Mary Robinson and Kofi Annan, took part in a live broadcast debate on BBC World to discuss some of the world’s biggest issues, from Syria and Ukraine to migration and extremism. Here are excerpts from their response to the question “should military action be taken against Islamic State? Kofi Annan: Yes, we cannot allow them to continue their brutality unchecked, but the region is so divided I think that left to themselves, they cannot stop them. One would need to have a coalition that brings together the regional powers, countries like Saudi Arabia, Iran, Turkey, maybe Qatar and Egypt, working with Russia, the United States and eventually other members of the Security Council, to make a common cause, to say we face a common danger and we cannot allow this to go on unchecked and come up with a common program to contain them. . .
Mary Robinson: I think that what Kofi is saying is what really needs to be done, that those that have different interests must come together because this is a devastating situation for the populations of Syria, of Iraq now, increasingly. . .
Hina Jilani: ISIS is not just hijacking the Islamic religion, but distorting it in order to put forward their own political agenda. I think it is not about religion. ISIS is about control. . . . It’s not about religion or any attempt to impose any kind of religious values, because those values are obviously values of peace, of tolerance, of humanity. . . . There is no other option but to use the military option, but at the same time it is always important to understand that military operations can never succeed in dealing with these kinds of forces unless and until a good social and political strategy is implemented in the areas where these forces are not active. Because it is the people that matter. It doesn’t matter that they are in control of a territory. What matters is that in the territory are people who are suffering these terrible crimes. You can’t fight violence with violence. That’s why – I’ve said it already – you have to have a proper social and political strategy . . . Yes, if necessary, military force must be used, but at the same time, the force must be used after a political and social agenda has been constructed on what to do thereafter. Kofi Annan: Let me comment a little on the use of force. Yes, we’ve seen the limits of the use of force and military intervention, and we need to have other aspects of policy that goes with it, both political and diplomatic and social programs, as has been indicated. It is frustrating to see the misery that the people of the region are going through. . .